WOW – The POLICE Dominator steals the show! Right on trend and ready for double action, POLICE watches are not about being demure. They’re about standing up and standing out for all the right reasons. 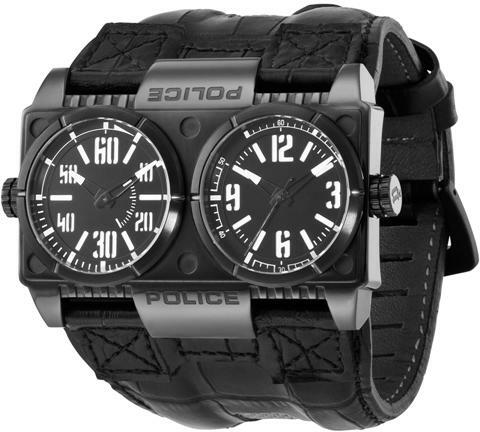 The Dominator watch from POLICE brings this attitude to life in a timepiece that makes no excuses. The black on black look is realized in patterned black leather, brushed gun metal stainless steel, black watch faces, and black engraving on the case itself. The rectangular watch features not one face – but two faces – one keeping track of the time, and the other a timer, ready to prove your worth to the world. The individual watch dials are skeletonized, with a white background showing through to separate individual numerals and markers. Individual crowns on either side keep the order in both dials. The overall effect is nothing short of powerful dominance! Reserve your POLICE DOMINATOR now.